There is a wide variety of planting that can create the necessary curb appeal for enhance the appearance of your income property. The wonderful thing about planting is that it gives back. Your investment, if kept healthy, keeps growing. 1. Boxwood can relate strongly to architecture because it can be clipped and shaped into hedges to follow the lines of the house. It's a broadleaf evergreen, so though leaves eventually darken in winter time, they don't shed like most deciduous plantings, thus adding a touch of green most of the year. 2. Columnar Beech trees add beautiful architectural forms to the landscape. Their verticality offers privacy and helps define the edge of the property. They can also be placed tightly together and kept clipped to act as a wonderful tall hedge screen. 3. Beech Hedging is popular because it's also resilient. It comes in green and purple, does not take up a lot of room, and has great structure. The purple-leaved varieties add a wonderful colour to the garden and the Beech tend to keep their leaves well into winter after they have dried out, adding winter visual interest and screening, when mist other trees are bare. 4. Japanese Maple is generally a great addition to a garden. These come in many colours, sizes and shapes – they make great feature plants in a garden. They can also have a wonderful layered look, framing gardens or making great backdrop plants as well. 5. Multi-stem flowering trees such as serviceberries, pagoda dogwoods, redbuds and birch provide great accent forms and structure in gardens. 6. Flowering trees such as apples, cherries, pears and magnolias provide a beautiful burst of colour in spring and enhance the look of the garden. 7. Ground covers such as ivy or periwinkle for shade and creeping thyme and sedum for sun are great alternatives to the grass lawn, adding beauty and variety to the garden floor. 8. Hardy grasses are also a good consideration because they withstand drought, tend to hold their form well into winter, and offer beautiful plumes. Larger properties normally require a good maintenance company to keep their landscaped gardens in order. These companies will make sure that soil is in good condition and that the plants are in good health. A professional approach will deter from destroying the plants or damaging the delicate materiality of the garden. As we are facing the effects of climate change, one important thing to consider is the balance between hard-scaped and soft-scaped areas. It’s a good to create rain gardens where runoff water can slowly percolate and be absorbed by the soil. Use of permeable paving also helps manage water runoff. Another good tip is to use a variety of native species of plants. Native prairie grasses typically withstand drought and harsh weather, with great varieties to choose from. 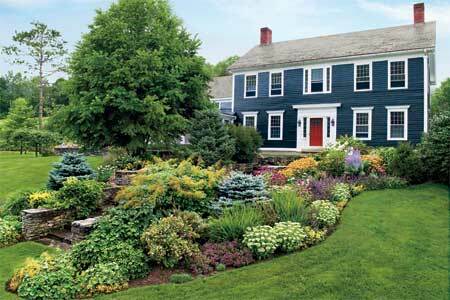 They add more resilience to the garden, thus adding visual interest as well as biodiversity. Sander Freedman is a certified landscape architect and owner of Sander Design (www.sanderdesign.ca). While providing solutions for outdoor spaces, Sander also specializes in sustainable design and environmental issues, and has more than 25 years in environmental related work and design. He can be contacted at 416-597-1703 or hello@sanderdesign.ca.